The tour leaves from the front of the Tourist Office in the heart of the Citadel. It was easy to park in one of the free car parks at the foot of the walls, so I have time to stroll through the small sunlit streets with cafés and artists’ workshops, as well as admire a few private residences with ivy-covered walls and lovely flower gardens. The weather is beautiful and twenty people are waiting outside the Tourist Office while Clara, our guide, takes everyone’s tickets. Our first stop is just 30 metres away, on the Place d’Armes. This overlooks the silt-laden water of the Gironde, providing Clara with the opportunity to explain the history of the largest and wildest estuary in Europe. Why is the water that colour? How were the islands formed and why do they change shape from one year to the next? Why was this a strategic location? Clara answers all these questions and then talks about the accomplishments of Vauban, a military engineer and architect who either built or transformed some 160 citadels in France. We learn that the one in Blaye is exemplary in terms of preservation and as an illustration of Vauban’s techniques and gift for adaptation. Fort Paté is across from us on the island of the same name. Fort Médoc on the opposite side of the estuary bears witness to Vauban‘s military genius. His three-point system of defence, called the Vauban Bolt, protected the approach to Bordeaux via the river. 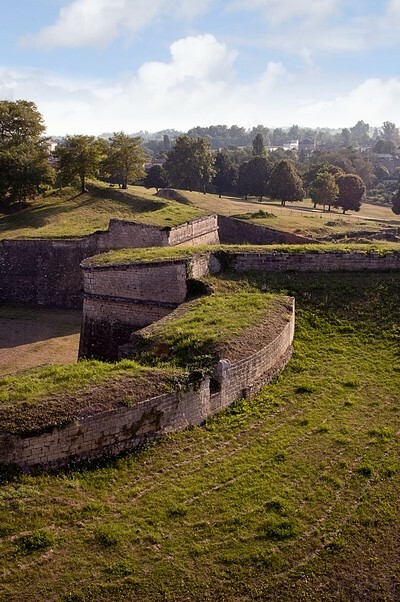 The tour continues with a discovery of the fortifications as seen from the ramparts – which also afford a magnificent view of the surrounding region – followed by a visit to the heart of the Citadel, where vestiges of ancient châteaux were ingeniously incorporated into Vauban‘s military strategy. We go on to see an access bridge maintaining a wall of the bastion and a casemate, or fortified gun emplacement, built to resist enemy artillery fire, which has since become a corridor… After admiring the majestic citadel walls in the bright sunshine, the coolness of the underground tunnels, accompanied by a series of historical anecdotes, is much appreciated by the group, whose members pause to look at cannon ports or under a ventilation vent before viewing the giant defensive ditches, bastions, and demilunes. Our visit has taken us into, on top of, underneath, and around the bastion facing the city. One of the last stages of construction was a large firing range first used by soldiers in the 17th century, then by gendarmes stationed in the Citadel in the 20th century and, these days, by the Blaye Gun Club. A last corridor takes us to the moineau, the oldest room in the citadel, built in 1510 in the château’s defensive ditch. Buried during Vauban’s earthworks, and so now with blocked canon ports and vents, this became a passageway for soldiers during the reign of Louis the 14th, as it is for us today. After going through a small gate and down a gently sloping path, we come to the end of the tour, and have returned to the fortress’s wooded park. Clara explains to us that the Vauban Bolt belongs to the twelve buildings forming the Vauban network of monuments listed as Unesco World Heritage Sites, in large part due to its excellent state of preservation and outstanding natural location. The group breaks up. Some people will be going to visit the viewpoints suggested by the guide, while others are attracted by the benches and picnic tables in the shade to take advantage of the Citadel‘s wonderful calm atmosphere and its panoramic view of the Gironde Estuary. I use this free time to walk around the walls one more time to have another look at the landscape and stone vestiges. The size of the grounds adds to the peacefulness of the place. In a relaxed state of mind, and within sight of the tall walls, I enjoy the lively streets, the café terraces, and the smell of crêpes – which reminds me that it has been an hour since the tour started, and that it’s time for a snack! Guided tour of the Citadel of Blaye via the underground tunnels Prices. Prices: 6 € per adult, 4 € per child (6-12 years old), and free for children under the age of 6.